Mellanie and Aslam’s home had character, a great location and a beautiful setting. Five years after moving in, the house had been transformed and only one piece of the puzzle remained: the kitchen. 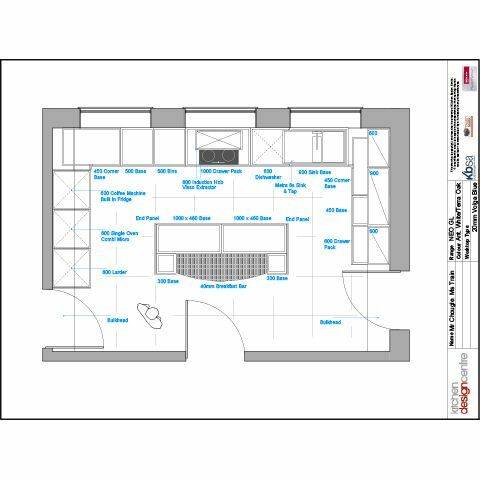 The large kitchen had plenty of open space, with fitted units arranged conventionally around the perimeter of the room. But while the design wasn’t causing them any problems, it just didn’t suit the rest of their home. Mellanie said, “When it came to design, we were looking to strike a careful balance – we wanted a contemporary kitchen rather than a traditional one, but we didn’t want to be too bold in case the design we chose aged quickly. 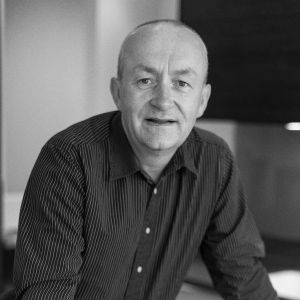 “We’d been to a number of kitchen companies before we found Kitchen Design Centre, but we just didn’t get that ‘click’. And while we did look at quite a few showrooms, most of the kitchens were laid out in the same ways. 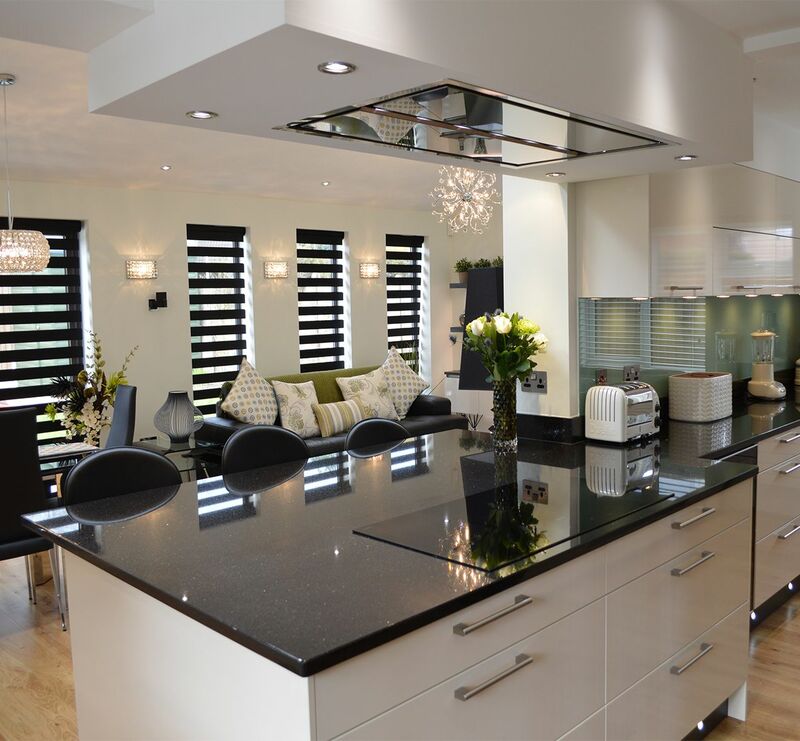 “With Kitchen Design Centre, it wasn’t just the design of the kitchens that caught our eye – it was actually the customer service that made the difference. After some less than ideal experiences with previous contractors, the trust that Mellanie and Aslam had in Roger meant that they could start to relax and enjoy the design process. Injecting some unique touches to a contemporary but classical kitchen is the kind of challenge the designers at Kitchen Design Centre thrive on. Roger decided to use some stunning finishing touches to create a truly unique space. The compact island in the middle of the room, complete with seating for two, features a classic Terra Oak finish and a curved breakfast bar that sweeps gently outwards, contrasting in an elegant way with the straight lines in other areas of the room. “Mellanie and Aslam were having trouble thinking outside of the original u-shaped layout of their kitchen,” commented Roger. Handle-less Terra Oak and gloss white cupboards from Kitchen Design Centre’s German Neo range combine to provide the couple with ample storage without interrupting the sense of space. A state-of-the-art Neff oven, microwave and coffee maker slot neatly in to one wall of units, their chic, brushed steel finish tying in with the clean grey-scale colour scheme. A smart Neff induction hob centred under the middle window in the kitchen gives Mellanie and Aslam a pleasant work space, while their Blanco Axia sink complete with Quooker boiling water tap just to the side makes cooking easier than ever. A crafty plan cooked up by Roger means that the extractor hood for the hob fits discretely into a bespoke made bulkhead above all three windows. For a little touch of something special, Roger made textures a real focal point, using Volga Blue natural granite for the work surfaces. 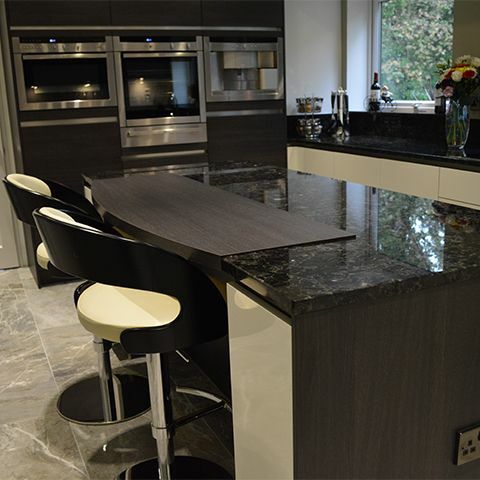 This dark granite contains flashes of rich green and blue, adding interest to an otherwise relatively neutral scheme and contrasting beautifully with the almost silver-white of the polished stone floor laid in large slabs. “I honestly couldn’t fault anything at all. The whole team involved in creating our new kitchen were all so professional and lovely to work with. They just came in and got on with the job in exactly the way we needed them to. “Since the kitchen has been finished, we’ve started spending a lot more time there. Although we were hesitant about having an island at first, it’s the perfect place to sit and take in the view. We never thought a kitchen could be a peaceful, relaxing space, but this one really is. “With Aslam working long hours, the kitchen is the perfect place for him to come in and finish up after a hectic shift. There are power sockets in the island, so he can just plug his laptop in and finish his work while I make dinner – it’s so much more sociable now. "Since the kitchen has been finished, we’ve started spending much more time in the room. 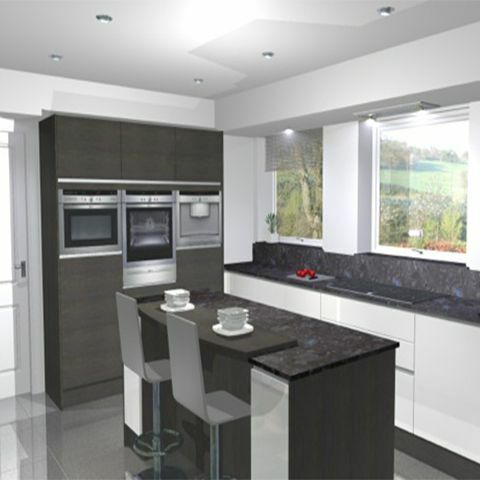 We never thought a kitchen could be a peaceful, relaxing space, but this one really is now"
"Being able to reassure Mellanie and Aslam that Kitchen Design Centre would take on the work and streamline the project felt great. It was lovely that they had confidence in us to deliver the room that they desired in budget and on time." 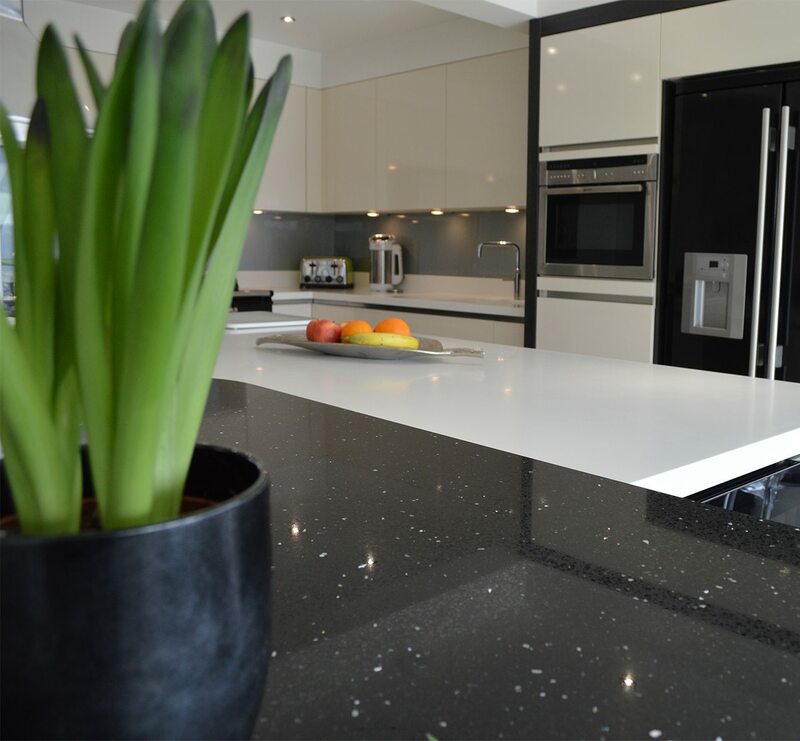 "We used clever design and quality pieces to turn a very empty, rectangular space into an elegant contemporary kitchen that makes the most of their space, both inside and out. I was told that the kitchen is now the nicest room in their already beautiful house, which is the best compliment you could wish for."